Post 137: Sharbot Lake – Observations, Reflections and Memories - A Snails Life and Lovin' it! It’s impossible to walk in the woods and be in a bad mood at the same time. – anonymous quote. With our decision to stay here (Sharbot Lake, Ontario Canada) for the winter, lots of great memories along with a bit of sadness crept into our thoughts and minds. At first we thought since we were going from 35 C temperatures last winter to -20 C this winter, we were going to miss all the wonderful times we had. After some soul searching and many quiet walks with our pups, we have come to the conclusion. Yes, our environment will be different (warmth and desert vs snow and ice). 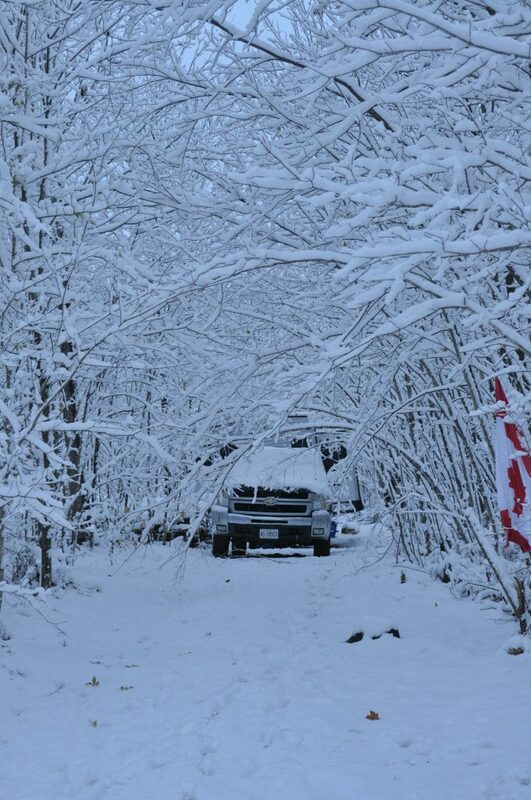 However, with a few exceptions, our experiences are similar to what we experienced last winter down south. We are still full time RVing – just a different twist. Yes, we miss the traveling to and from last years snowbird destinations. Quartzite, AZ and Midland California LTVA areas was where we spent the winter last year. But, once we were at the LTVA areas we were fixed in one spot, just like we are here. In the LTVA area we were dry camping. We are doing the same here at Sharbot Lake. Sure camping the the cooler temperatures will be a bit of a challenge. But so was camping in 38 degrees C (100 F). Still practicing this – maybe even more so here in Sharbot Lake. We’ve seen more wildlife here at Sharbot Lake LOL. As strange as it sounds, we have seen more wildlife here at Sharbot Lake than in our entire travels over the last 12 months! Beavers, Fox, Porcupine, Qual, Deer, Snakes just to name a few! Looking forward to seeing more of nature as we become more familiar with the area. Since we became full time RVers, walking and hiking in the wilderness has always only been a few steps away from our RV door. Unless we were staying at a campground in the middle of a city (KOA in Las Vegas or KOA near White Sands ). The same is true here at Sharbot lake – literally steps from our door is a lush forest with many hiking paths and trails. In fact the Trans Canada Trail is only a few meters from our doorstep. (See post 135 for more information on hiking)! Traveling offered the opportunities of seeing different places on a regular basis, until we reached the desert. Well, kind of the same here. Sharbot Lake is new to us, as is all the surrounding areas. Lots of sights and attractions to take in over the winter months. As we traveled, we were constantly meeting new folks. Some of which became friends and who we stay in touch with. Other folks we just spent a night or two around a campfire enjoying each others company. Sharing stories and then moved on the next day. Both experiences were pleasant in their own ways. Here at Sharbot lake, we are meeting new friends as well. There are three other families with RVs at our ‘campground’. We have enjoyed their company several times while being here. As time moves on, I’m sure we will become better friends. We are also meeting people in the area while we are out shopping and sightseeing. 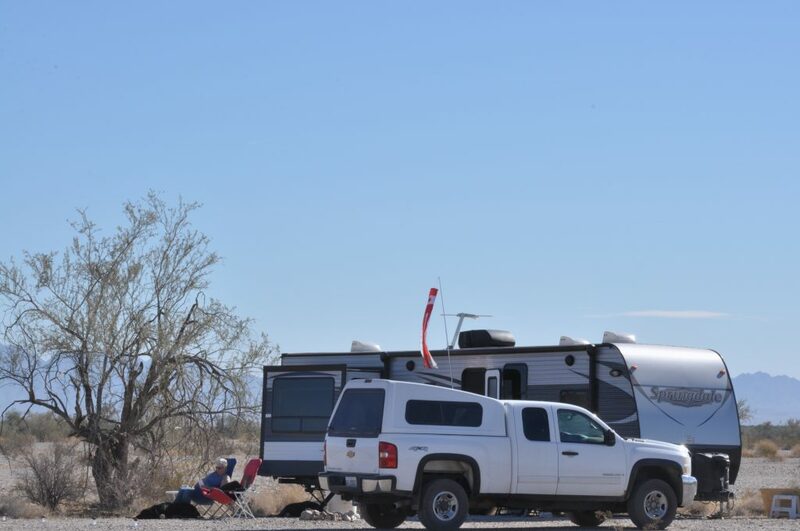 The mind set of people around us: at the BLM Long Term Visitors Areas (Quartsite AZ and Midland California). Almost everyone around us was in a similar situation and in a similar mindset to us. Escaping winter, RVers, and retired or soon to be retired. It was understood that you were living in your trailer / RV / Van / Motorhome. With these traits in common, most folks had similar habits and / or routines. Dumping grey and black water, finding fresh water to replenish your tanks, getting propane tanks filled. These are only naming a few ‘unique’ activities. It was easy to strike up a conversation since you had so much in common. The biggest difference! This winter we will be near family! We are looking forward to seeing our 3 boys and their families throughout the winter. Something we missed very much last winter! In addition to our boys and their families, we will be able to get together from time to time with other family members and our long time friends! Enjoyed this post. I definitely agree with the anonymous quote. I hope you are staying warm! Yes, we are staying warm and we are actually enjoying the snow and winter. It was nice being home for the holidays this year. Maybe we will catch up next winter down south.